The long-term success of an industrial company is largely dependent on the life cycle of its products and the innovative capacities to further develop these products. Therefore, the management of product development should have the same high priority as the management of financial, operative or sales activities. The current practice of management reporting of research, development and innovation is too cost-based and only takes place downstream on successfully processed projects. Therefore, there is an urgent requirement according to our discretion for an anchoring in central governance and a dedicated management process of regular meetings of management or executive board. Portfolio management is the required method used in order to support the planning of successful innovation activities with the help of solid information management, the establishment of central governance, efficient resource management and continuous performance monitoring. The following study is a survey of current practice of portfolio management for the strategic management and governance of product development. A representative group of German industrial companies provided information, which resulted in a unique collection of information that contained astonishing information and suggestions for pragmatic improvement. We confronted the companies with quantitative and qualitative questions regarding management, governance, process, systems, resource management and social aspects. These questions aimed to reveal whether the management of product development via portfolio management is practically implemented and successfully applied. As it turned out, the interviewed companies proved to be experienced interlocutors as they had already applied methods for selection and control of product development projects for a long time. According to them, there is apparently a high potential for improvement due to structural problems of responsibility within the first and second management levels. However, a lack of willingness to engage in dialogue about optimal portfolio organization is not the problem but an unexpected simplified handling of portfolio methods. The huge strategic importance of this issue and the implementation of currently available solutions are disproportionate due to certain processes and IT systems being at the most basic level. Given the existing infrastructure, it is not possible to collect the variety of information necessary for the preparation of sound decisions. Analytical methods that may bring deeper insights are not applied on a broad level, important long-term portfolio management decisions are mainly made on a communicative level and key figures are freely interpreted. The visual presentation and interpretation is dominating. Companies that have highly excellent processes and systems, live governance and have motivated employees and a large management commitment. Companies that already have well implemented processes and systems but still exhibit clear weaknesses in governance and strategy implementation. In these companies, top management does not seem to support such issues sufficiently. A large potential for improvement within processes and the IT landscape is seen due to management aspects in the R&D controlling with issues of governance already being well implemented. Insufficient preparation in the dimensions of existing issues. Due to various reasons these companies either reject the idea of portfolio management or they have only recently started to implement processes. 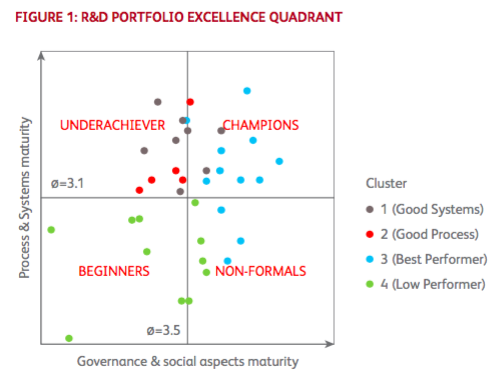 The classic portfolio management tool provides all participants with a surprisingly large space for development in terms of management, process and IT-knowledge as well as experiences in dealing with change. Furthermore, there is a remarkable difference between internal and external perceptions with regards to maturity level and the associated actual practice within the companies. The following study identifies best practices that if implemented would lead to a more effective governance of product development.